Shakespeare had an uncanny knack for zeroing in on the essential and timeless truths of the human condition, including money matters. And though Rosalind was clearly not referring to money when she asked Orlando “Why then, can one desire too much of a good thing?” in As You Like It (1599), it’s timely to ask that question in the context of dividends more than 400 years later. With bond yields plunging around the world, yield-hungry investors are frothing at the mouth for alternatives that pay a premium to the paltry income available from U.S. Treasurys. Among fixed-income securities, the instruments of choice are junk bonds and emerging market debt. In equities, it’s the bond-like stocks that have historically paid reliable and rising dividends. These stocks include the Dividend Aristocrats (S&P 500 companies that have increased their dividend payouts for 25 consecutive years) and even non-noble companies that pay above average dividends, such as consumer staples generally. The 13% year-to-date total return of the Dividend Aristocrats index (through August 26) is nearly double that of the S&P 500 total return of 7.7%. The problem, of course, is that many investors seem to be willing to pay any price for yield income. And in doing so, they ignore two obvious fundamental risks: First, dividends aren’t ironclad; they’re discretionary and can be cut or eliminated at any time. Second, and more importantly, prices may decline. According to Professor Aswath Damodaran of New York University’s Stern School of Business, through the first two quarters of 2016, S&P 500 companies have collectively returned 112% of their earnings through dividends and buybacks—which is the highest level since 2008 and well above the 82% average over the past 15 years. Only governments can run their finances this way indefinitely. In the private sector this is unsustainable, and something has to change. Either earnings have to increase, or returns to stockholders have to decrease, or both. The new mantra on Wall Street is that you should buy stocks for income and bonds for capital gains. This is, of course, backward. And it will end disastrously for those who follow this foolish approach. To be sure, in the past, based on recent comparative yields, we have strongly advocated for the obvious income advantage of owning the S&P 500 over 10-year Treasurys (see “Exercise the Free Dividend Option,” February 22, 2016, and “Dividends: Growth in Income,” March 21, 2016). As recently as August 26, 2016, the 10-year Treasury yield was 1.63% and the S&P 500 dividend yield was 2.11%—a difference of 0.49%. In other words, the S&P 500 is currently paying nearly half a percentage point more in income annually than the 10-year Treasury, effectively providing 10 years of earnings growth, dividend growth and potential for capital appreciation—free. The critical nuance is that when we point out the foolishness of chasing dividends, we’re not talking about the S&P 500 as a whole but about concentrating investment in the high-yielding stocks that are today’s market darlings. But there are three major warning signs flashing bright red that argue against this strategy: (i) Valuations for bond-like stocks are very high right now, (ii) the current correlation between dividend yield and the S&P 500 is unusually high, and (iii) volatility has been extremely low lately. Let’s look at some data for each of these to show why there is cause for concern. Valuation. As recently as 2013, the consumer staple stocks sector traded at a P/E ratio of about 10x—or at about a one-third discount to the historical average multiple for the S&P 500. Three years later, consumer staple valuations have more than doubled. At today’s valuation of over 21x earnings, the sector now trades at about a 15% premium to the S&P 500’s current multiple of 18.6x trailing operating earnings (which itself, in this near zero interest rate environment, is about 20% above historical averages). And remember, these are not exciting, world-changing technology stocks—they are boring (but good), low-growth companies. Correlation. A recent article in The Wall Street Journal (August 25, 2016) highlighted data from S&P Global Market Intelligence discussing trends in the correlation between the dividend yield of companies in the S&P 500 and the index’s overall performance. The five-year rolling correlation between S&P 500 companies’ dividend yield and the index’s performance has been at 0.95 or above for eight straight quarters ending in June, the Journal reported. The last time it was that high was 2007, and before that, the average since 1941 had been 0.5. Draw your own conclusions. Remember that correlations show how independent variables change in relation to one another, with a correlation of 1 indicating that the two move exactly in sync and a correlation of -1 indicating that they always move in the opposite direction from each other. Variables with no discernible connection to one another have correlations close to zero. 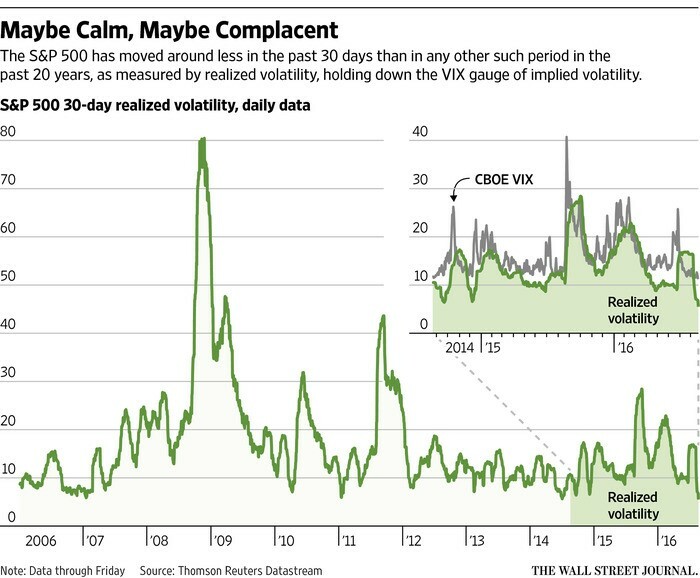 Volatility. An eerie calm has descended on the U.S. stock market. According to a recent Wall Street Journal article (August 23, 2016), “the past 30 days have been the least volatile of any 30-day period in more than two decades.” Or consider the price action from the early part of 2016 to today. For the 35 trading days ending Friday, August 26, the S&P 500 traded at least 1% higher or lower than the previous day’s closing on only one day. By comparison, during the first 35 trading days of 2016, the index traded more than 1% higher or lower than the previous day’s close on 30 days. Here’s a concrete illustration of what money chasing dividends looks like in the real world: The Vanguard Dividend Growth Fund (VDIGX) doubled its assets from about $15 billion to $30 billion over the last three years. In the first six months of 2016 alone, investors poured $3 billion into the fund. But that’s just one fund. According to Morningstar, assets in dividend-focused mutual funds and ETFs have swelled to $672 billion today from $367 billion at the end of 2011—an increase of 83% over the past five years. Money flowing into a narrow segment of the market pumps up prices but also increases valuations. There is a self-reinforcing momentum effect at work, with investors making decisions based on recent price action. Investors chase performance, and it will always be thus. To Vanguard’s great credit, it closed the Dividend Growth Fund to new investors at the end of July. But investors will easily find similar funds as outlets for their yield-chasing folly. Investors chasing yield at any price are oblivious to one of the most basic equations of investing: Total return = income + capital appreciation. But of course capital “appreciation” can be positive or negative—in other words, depreciation. So a premium dividend yield of 3% would be more than wiped out by a price decline of 10%, 20% or more. In finance, there is no more powerful a concept than that of reversion to the mean. So it’s only a question of when—not if—equilibrium will be restored and certain sectors such as consumer staples will regress to their long-term mean valuations. And when that does occur, the yield chasers who pursued high-dividend-paying stocks in lieu of low-yielding bonds will be badly burned and staring at red ink on their monthly statements. And those investors will have only one enemy to blame: themselves. Buying stocks for income and bonds for capital gains aptly demonstrates the concept of recency bias. This cognitive bias occurs when someone evaluates a situation or makes a decision based on recent, easily remembered results while ignoring relevant longer-term facts and relationships. This leads to incorrect expectations about prospective return and risk alike—and correspondingly bad investment behavior in the form of market timing, asset allocation and individual security selection.